Riviera, Australia’s most awarded pleasure boat builder is now putting the finishing touches on its newest model, the 53 Enclosed Flybridge, as it nears completion for its world release at the Sanctuary Cove International Boat Show in May. Riviera’s new product development manager Neil McCabe and his team have been working on the 53 for the past two years and all are extremely pleased with the result. Neil said the new 53 had recently undergone its first sea trial and has now moved into the Fit Out Two stage where the finished timber and cabinetry will be installed. “Now the boat has had a sea trial, we have been able to assess the data and can now fine tune the 53’s performance,” Neil said. “Our engineers loaded the boat with water bags which were put in specific locations to simulate the final weight distribution of the 53 including the owner’s personal equipment and items so that we could get very accurate running information from the sea trial. “The running angle was within our desired forecast so this is very pleasing for hull number one. The hull and deck have been joined, windscreens and bathrooms fitted, and the cabinetry is well progressed. “The engine room has all major components fitted and the final templates are being made for the galley bench tops and leather lounges,” Neil said. Long time Riviera Skipper Mark Lawson said the 53 Enclosed Flybridge performed exceptionally well on its inaugural sea trial. “The boat is stable and responsive when turning and overall it will certainly be a comfortable costal cruising boat with exceptional fuel economy,” said Mark. Riviera has already received 12 orders ‘off the plan’ for this exciting new flybridge from enthusiasts in Australia, the US and Europe and many potential owners are coming from around Australia and overseas to inspect and sea trial the 53. “We have already had a significant number of customers place forward deposits and the owners of hull number four have just reviewed the boat and they were absolutely delighted with the aft galley, large cockpit and saloon, full beam master stateroom and enormous flybridge,” Neil said. “They are moving up from their current boat, a 47 and they were in awe of the size, space and luxury appointments on board the new 53. 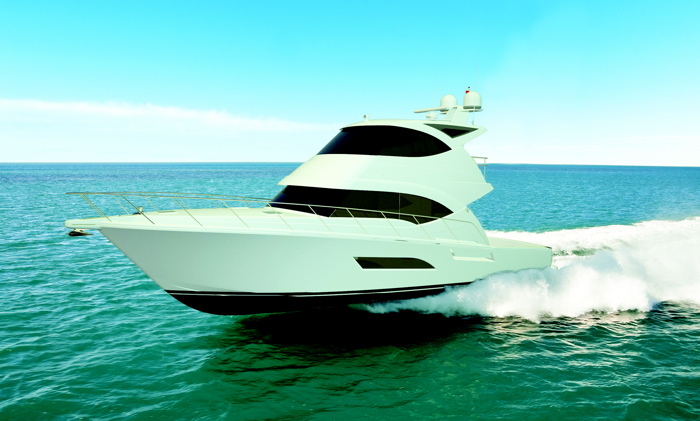 The new 53 Enclosed Flybridge will make its world debut at the Sanctuary Cove International Boat Show held May 19-22.